Who says Hartford doesn’t have claims to fame beyond insurance giants, Mark Twain and Samuel Colt? Not I! And I’m not just talking about such important things as the largest colonial building in the world or the world’s first two sided building. No, I’m talking about the world’s largest stone arch bridge! I’d bet that almost every Nutmegger reading this has driven (or slowly crawled) over the Bulkeley Bridge at some point in their lives. And now, you’ll have something cool to tell your poor kids about it the next time you do. In 1926 one of the Bulkeley Bridge’s engineers speculated, probably correctly, that it was the last monumental stone bridge that would ever be built. Within a few years of its conception, concrete and steel had entirely replaced stone in the construction of large bridges. Not only was it the last of its kind, but also in many ways the Bulkeley Bridge was one of the greatest. Five of its spans are longer than any of the other stone arches in the state; 100,000 cubic yards of pink and gray granite were consumed in its construction; the tolerances for the stone-cutting were unbelievably close (less than 3/8″ over the whole face of a 10-ton block); and its total cost, some $3 million, made it for many years the most expensive bridge built in Connecticut. Four people perished during construction, and the chief engineer, Edwin Dwight Graves, suffered a nervous breakdown from which he never recovered. 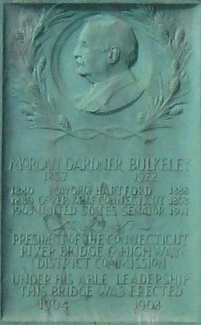 The Bulkeley Bridge was built to replace Hartford’s 1818 covered bridge, which burned in 1895. 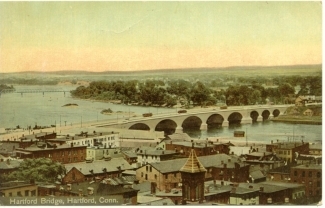 Hartford’s civic and business leaders were determined that the new bridge would be “an ornament to the city which should endure forever.” To create a proper setting, the bridge commission tore down rows of tenements and constructed wide, landscaped approach boulevards on both sides of the river. In designing the bridge, the architect and engineer studied numerous ancient European bridges, and they decided that uncomplicated geometry and restrained architectural detailing would create the proper sense of “strength, beauty and dignity.” The Bulkeley Bridge’s tremendous scale, plain but graceful lines, arched form, and simple Classical ornament make it one of the state’s pre-eminent examples of Neo-Classical architecture. So why “Bulkeley?” Well, if you dutifully clicked the link above to the largest colonial building in the world, you learned that not only was Morgan Bulkeley a former Aetna president, but also a former governor and U. S. Senator. He was an early proponent of the bridge and chairman of the special commission created by the State Legislature to oversee its construction. 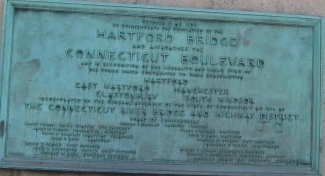 After his death in 1922, the bridge, originally known simply as the Hartford Bridge, was renamed in his honor. Hi! I’m doin a project that’s due in 2 days (i just got the paper 2day) and i had 2 do the biggest bridge in Connecticut. This kind of helped me but i needed more info. O well, i’ll just look at other websites. 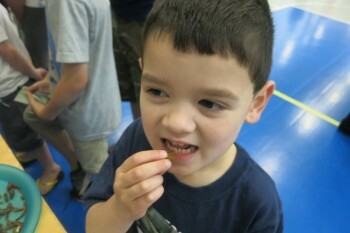 This wuz awesome! It helped me on my research report that is due 2morrow!!! Ugh. This is the crap that makes me cry. I fear that ALL research will soon become what Layla did and ALL English will become bastardized with stupid text shorthand like she’s used here, although “wuz” is no shorter than “was” – it’s just stupid. Layla, I hope you get an F.
Well, not only is the young’uns English abyssmal, the “facts” aren’t accurate either!! The world’s largest stone arch bridge actually spans the Susquehanna River at Rockville, Penna. It’s a railroad bridge, so not too many people know of it. maybe we should be teaching true research techniques in our colleges instead of relying on Wikipedia for everything?? To be fair (to me), the bridge is listed in a couple non-Wiki sources as the world’s largest. Including a book all about bridges. So I’ll stick with it. After all, this subject is so arcane, no one will hang me for being wrong. Actually, the Rockville Bridge in Pennsylvania is the largest stone-arch bridge. It makes this bridge look like a toy. I wonder if the Bulkeley Bridge is somehow “larger” because it’s so much wider? Who knows. I’ll add an asterisk. It’s only the second largest though (or rather, the second longest stone arch span), however it does have the longest arch span for railway bridges. Yes, the longest stone arch bridge in the world is the Rockville Bridge located in Marysville, PA. I know this to be true, because I live near the bridge and it is very beautiful! It is also a working railroad bridge and is used every day. People come from all over the world to view the bridge and take pictures of the trains that cross it. Rockville Bridge in PA is 3820 feet long, 52 feet wide, and 46 feet above normal river water level. As Janis says, people like to photograph it, but not many people have walked across like my Ed and I did this weekend. Well, we got about 1/4 of the way across before getting kicked off by railway personnel. But we did manage to collect some mementos from the side of the tracks: a piece of rail and several old spikes. It was a great adventure! I have photos taken on top of the bridge. The Bulkeley consumed “over 100,000 cubic yards” of pink granite. The Rockville consumed “almost 100,000 cubic yards of masonry.” also, the Bulkeley has larger arches, (90 feet vs. 70 feet) for what that’s worth. And while the difference between “largest” vs. “longest” is admittedly silly, it IS a difference worth noting and I am confident enough to stick with my designation. Please correct yourself. Officialy the largest stone arch is Solkan Bridge in a beautiful SLovenia. Arch span 85 meters!